Hanoi (VNA) - The development of high-tech agriculture in Vietnam remains sluggish due to unplanned and small-scale production, and is not commensurate with the country’s comparative advantages and efforts. So far, only 28 enterprises nationwide have been recognised by the Ministry of Agriculture and Rural Development (MARD) as high-tech businesses. At a conference held on August 14 by the MARD in the Central Highlands province of Lam Dong’s Da Lat city, participants agreed that development of technology-based agriculture is essential for Vietnam’s agriculture sector to achieve greater value-added for export products, global competitiveness and consistently high quality. Speaking at the event, Deputy Minister of Agriculture and Rural Development Le Quoc Doanh said over the past three decades of renovation, Vietnam has become self-sufficient in food with an annual export of 30 billion USD, providing livelihoods for 10 million rural households and contributing nearly 22 percent of the gross domestic product and 23-35 percent of exports. However, the agricultural sector tends to grow slowly due to spontaneous and small-scale production, limited technological application in agro-forestry-fisheries enterprises, and impacts of climate change, environmental pollution and food hygiene, he said. The Government has adopted various policies to promote the development of high-tech agriculture. In 2012, for example, the Prime Minister issued Decision 1895 approving implementation of an agricultural development programme using high-tech applications. The programme aims to promote the development and effective application of high technology in the agricultural sector, contributing to the development of a large-scale, modern, and highly competitive and comprehensive agriculture model. It also targets an annual growth rate of over 3.5 percent in the agricultural sector while ensuring national food security. In 2015, the PM signed another decision approving the master plan to build 10 high-tech agricultural zones by 2020. But in fact, by mid-2017, the whole country has only two high-tech agriculture zones, established in the southern provinces of Hau Giang and Phú Yên. During the conference, participants hailed Lam Dong province for being on the way to becoming a model of high-tech farming. The province has tremendous potential to attract more foreign investment in high-tech agriculture due to its climate, land and proximity to the southern economic region. 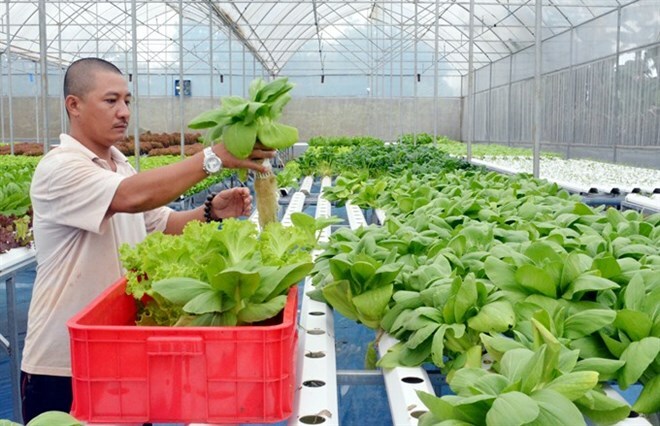 By applying technology in cultivation, the average value of hydroponic vegetables grown in the province has reached 500 million VND per hectare per year, and the value of flowers touches 1.2 billion VND per hectare per year. The figures for tea and coffee are respectively 250 million VND and 240 million VND per hectare per year. Many farm produce of the province have been exported. However, according to Nguyen Van Son, Director of the provincial Department of Agriculture and Rural Development, farmers and businesses engaged in high-tech agriculture in the province still face many difficulties relating to land funds, shortage of investment, and access to investment capital. A representative from the Ministry of Natural Resources and Environment’s General Department of Land Management underscored the need to refine regulations on the rights of land users and issue policies to encourage the rent of land use rights. According to the State Bank of Vietnam (SBV), outstanding loans for high-tech farming amount to 177.4 billion VND (7.71 million USD), but farmers are hard pressed to pay them back due to lack of information about domestic and foreign consumption markets. The SBV directed commercial banks to offer more loans and pledged all possible support throughout the process.